Boil the quinoa in the broth for about twenty minutes till the stock is absorbed. Then place the quinoa in a bowl. Chop and set aside about half a cup of the parsley. Puree the rest of the parsley with one cup of water, then placed in a cheesecloth over a small bowl. Ring the liquid from the puree and discard the solids. Add the chives, butter, parsley juice and chopped parsley to the quinoa, mix well and seasoned with salt and pepper. 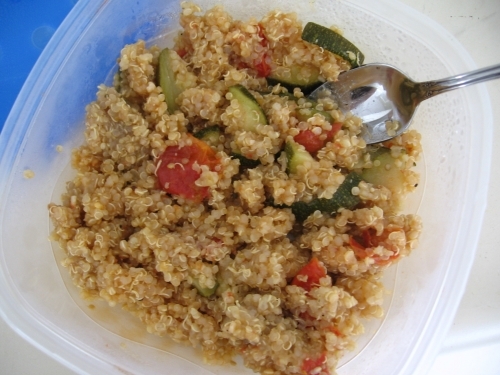 Quinoa is a highly nutritious food, and is considered a complete protein. It’s also rich in fiber, carbohydrates, the B vitamins, zinc, Vitamin E, iron, and magnesium. As it’s a good breakfast food, a good drink to go with it would be tea or milk. It’s often served with fruit or in pilafs, with vegetables and spices. Tomatoes and zucchini are my personal favorites!